Through our extensive global contact network of asset owners and market intelligence we are able to generate, screen and evaluate acquisition opportunities that meet your criteria. HEA offers three main services to companies wishing to acquire upstream oil and gas or renewables assets or projects. Search and Screen: We can conduct market research as well as use our existing network and opportunity databases to search for assets/companies that meets the client's requirements and also high grade these against strategic criteria. At any time, we have knowledge of a range of public and also private (off market) opportunities which may fit a client's criteria. Using our extensive contact database we are also able to approach companies discreetly and directly to understand their holding position on specific assets or projects if you have already screened or identified options. After the identification and screening phase we are able to assist or lead with the evaluation and due diligence of the assets/ company, preparation and submission of any offer as well as and negotiation of terms and any transaction documentation. Bid/Auction support: For public transactions, HEA are able to help with the project management, evaluation and commercial due diligence of the assets/company, analysis of competitive position, submission of a competitive offer, and negotiation of terms and any transaction documentation. HEA are able to embed in a wider project team, lead a project team and coordinate other advisors or provide an independent external review. 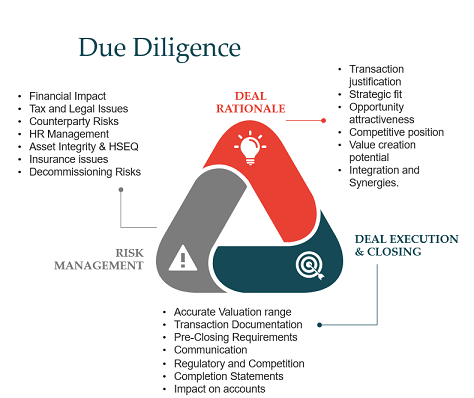 Due Diligence Support: HEA are able to provide standalone commercial due diligence and /or economic modelling analysis for your acquisition projects. Whether you need a "red flag" review of a suite of existing commercial agreements or a full scope data room due diligence review, our team can provide the correct insight to help you understand the assets or company you are considering to acquire. In early 2019, we will have a number of toolkits and templates available for purchase in our Online Shop relating to acquisitions and due diligence processes.